Yoshi’s mother’s calligraphy decorates the brewery and the label. 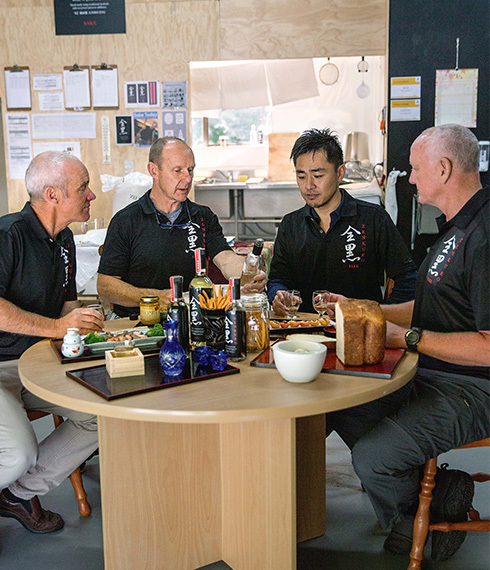 The think-tank of Richard, David, Yoshi and Craig thinks a whole lot better when there’s sake for smoko. Sake is a special rice which has the starch concentration in the centre of the grain. Sake is brewed under temperature-controlled conditions for several days. 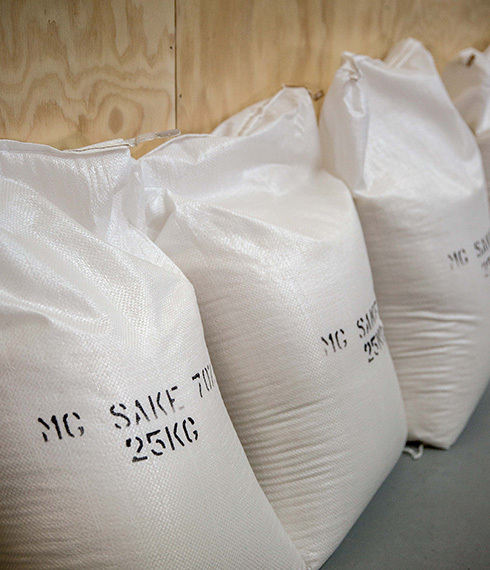 The sake is filtered through cotton bags. 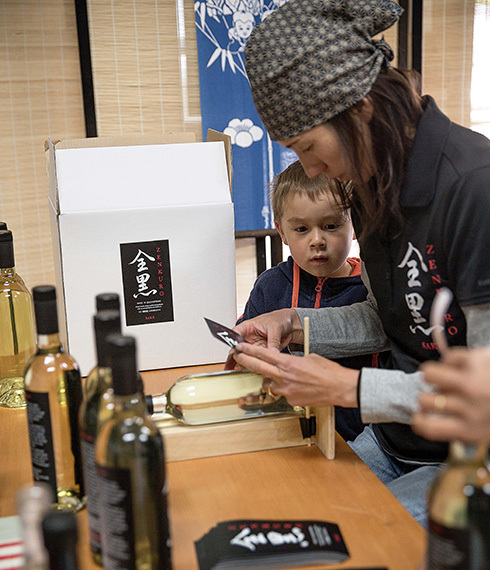 Yasuko Joll has son Tyler keeping a close eye on her as she uses chopsticks to ensure perfect label placement. 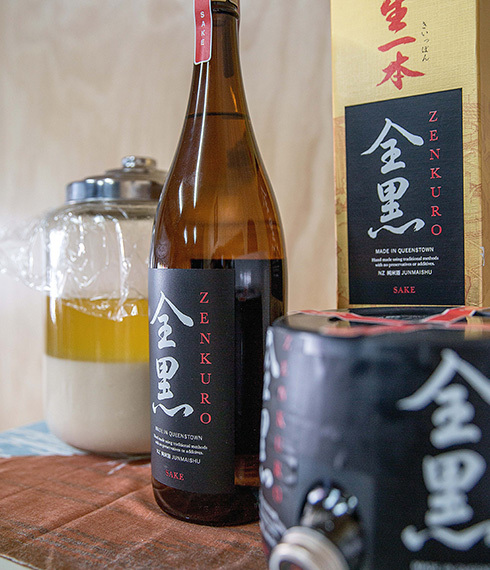 There’s a new sake brewery in Queenstown. 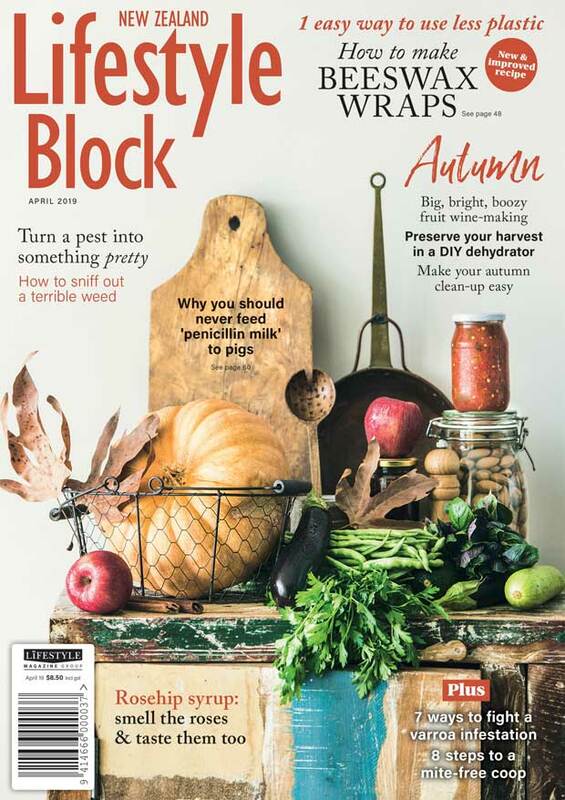 How it got there involves three middle-aged men, helicopter honeymoon flights, rugby, karate, mountain climbing and an international ski-jumper all knitted together. Craig MacLachlan studied Japanese at school and university. “My mates all went on OEs to London, but I went to Tokyo,” he says. He studied karate and taught English and made enough money to come home to Queenstown and get his commercial pilot’s licence. He started offering honeymoon flights to Japanese tourists. They married a year later.David Joll went to Japan on a school exchange when he was 16. Not a single person in the low-decile Shizuoka Prefecture fishing village he went to spoke English. 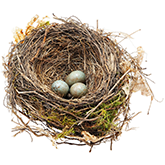 He then spent 15 years studying, playing rugby and working in Japan for a property-investment company whose owners took him under their wing and are still like family. 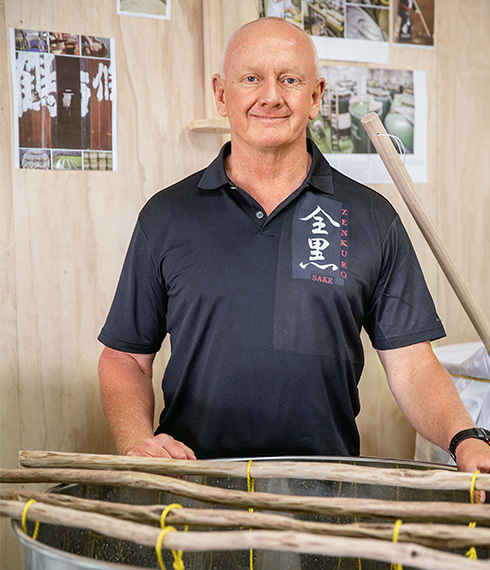 Their highly ranked ski-jumping grandson has played a vital part in making the New Zealand sake project a reality. Richard Ryall was a geology graduate from Leeds. “I was on an odyssey around Asia and by accident ended up on a boat from China to Osaka. What started off as a one-month quick look around soon became a life-changing stay, giving me many of the things that I had originally left the UK looking for… language, some understanding of a totally foreign culture, direction and some valuable yen. Japanophilia is not nearly a strong enough a word to describe the trio’s passion. The three of them now may well know more about Japan than most Japanese. They have written a number of guidebooks in Japanese and English and are fluent in both languages, their CVs bristling with academic qualifications. Between them they have black belts in various martial arts, records for climbing all of Japan’s 100 famous mountains, have walked the country’s entire length, studied and worked there. When they aren’t taking Japanese hikers and mountain climbers into New Zealand’s national parks with their nearly 25-year-old Tanken Tours company, they are taking foreigners hiking and mountain climbing in Japan and Europe. Apropos of passion, the trio’s real love is rugby. 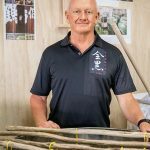 It’s become a major passion in Japan as well, and while they were watching the All Blacks work their magic in the 2011 Rugby World Cup and enjoying some very fine sake, they had the very fine idea of making the first New Zealand brew. The idea refused to go away, even with the seemingly hopeless struggle to get a reliable recipe. Suggestions from the Internet saw a lot of rice – and time – wasted. This fermented rice drink has been around since 300BC, but the secrets of making it are very tightly held. 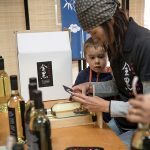 Last year, the trio became a quartet when they finally set up a company with the backing of Tokyo-based Yoshi Kawamura (the ski-jumper) who is on the Japan New Zealand Business Council and also has the knowledge from expert Japanese sake makers (touji), making his own brand in Vancouver, Canada. With his help, David, who is the brewer for the team, was able to access the secrets of the touji. David’s total immersion experience in the fishing village stood him in good stead for the total immersion required for sake brewing. Real touji live at the brewery during the winter the whole time the sake is being made. 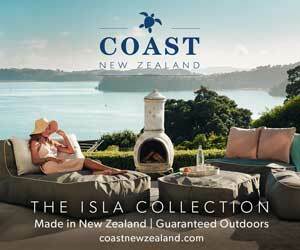 With his new knowledge, a New Zealand brand called Zenkuro was born. The Japanese character zen means all while kuro means black. Fermentation stage at the brewery and the air smells deliciously yeasty. David tickles up the sake mixture with a special wooden paddle to make it belch and bubble. The place appears a bit laundry-ish, with what look like pillowcases hanging up and ordinary white bed sheets and blankets wrapped around the shiny tanks. Garden hoses snake around the floor and local rocks prop up various bits of equipment. A lump of greenstone holds the cooling system cabinet cover in place. Manuka poles wait ready to hang the draining bags of moromi. 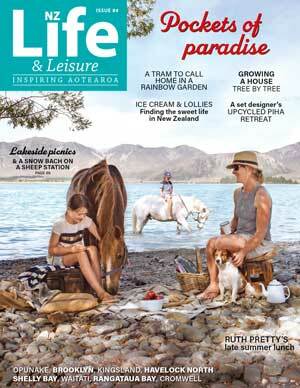 There’s a wonderfully Kiwi DIY feel. While the sake is the main reason for all this effort, the leftovers (sake kasu) also have value. By-products like rice crackers, bread, pretzels, soap and beauty products are but a few of the uses. The team is experimenting with the sake kasu with each press. As soon as any of this sharp-smelling, sticky white paste becomes available, the local Japanese community get wind of it and pop in to get some. No wonder – the white bread made with it almost has a sourdough flavour but with a fabulously crusty crust, and apricot halves filled with a mixture of thyme honey and sake kasu… mmm. 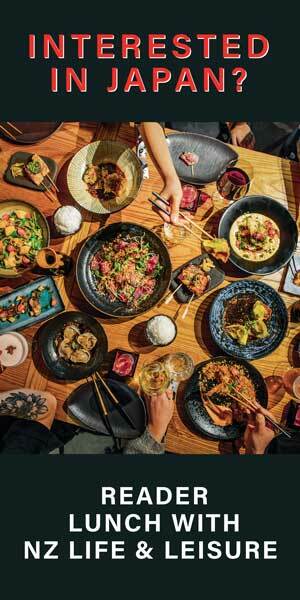 The Zenkuro team serves a taster of lightly chilled sake to go with these snacks. It’s a million miles from the traditional warmed version – gently tart and sweet at the same time. Just one taste is enough to be sure that Zenkuro sake will be on the lips (in both senses) of rugby fans (and other more normal people) soon. 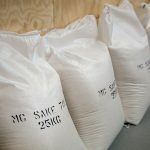 “Sake is often labelled as a wine, due to the lack of carbonation and relatively high alcohol content (14 to 20 per cent), or as a beer because it is made from grain,” says David. 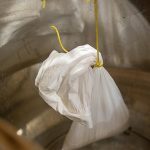 He explains that a mould called koji-kin, cultivated onto steamed rice, provides the enzymes that perform the saccharification, just as malting does in beer production. The key point is that unlike beer or wine, saccharification and fermentation take place at the same time in the same tank. This process is referred to as multiple parallel fermentation. 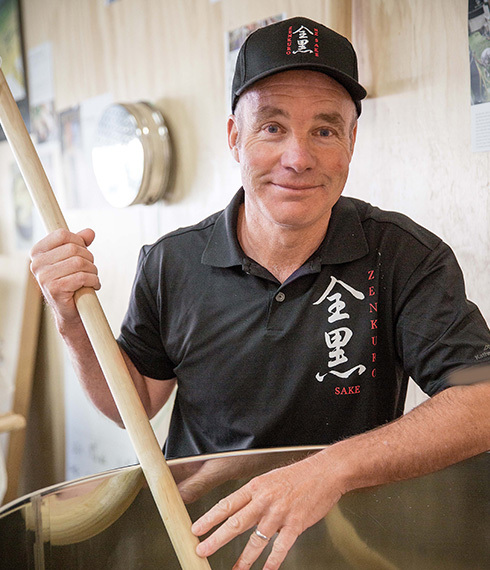 “All the ingredients are added to the tank over four days – nothing in sake making happens fast – then the mash (moromi) temperature is carefully controlled at 10 to 15 degrees Celsius for 21 to 35 days, depending on the style being produced. 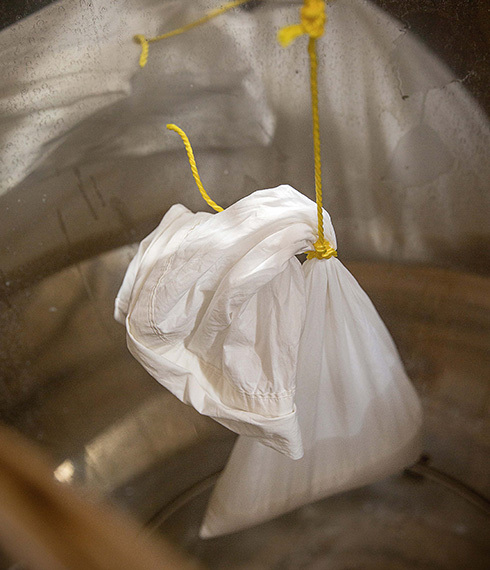 When the touji decides it is ready to be pressed, it is poured into long cotton bags, then pressed or hung, allowing the sake to filter through. This is followed by more gentle filtration and aging in controlled conditions. At this point the sake is rather powerful and is brought down to a more palatable 14 per cent by dilution and it is bottled. No preservatives are used so once bottled the sake is heated to pasteurize it. 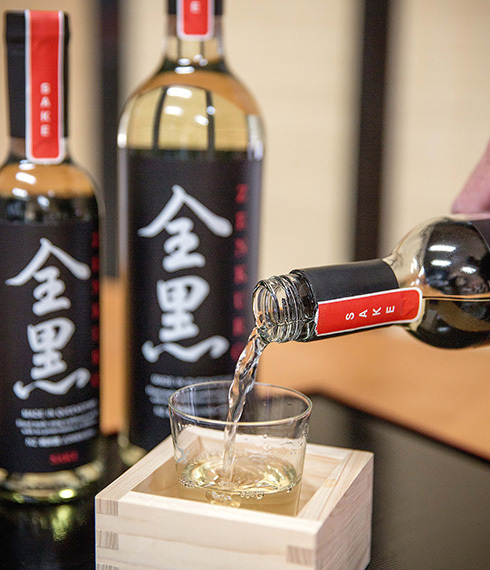 * Premium sake is better drunk slightly chilled so that the changing flavours and aromas can be enjoyed as it warms up. As with good wine, larger glasses enhance the flavour. To avoid hangovers, always look for the word junmaishu on the label. This means it is pure rice wine with no added distilled alcohol. * Small cups are used for social reasons – typically you fill someone else’s cup and they fill yours. The traditional 180ml cedar cups, called masu, are also used for measuring rice and add a woody aroma to the sake. *Sake can be anywhere on the spectrum from very dry to very sweet, but generally it goes well with seafood, chicken, barbecued food and anything salty. 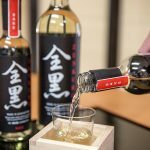 *The variety, nigori sake, which still has some of the lees in it, is cloudy or milky and can be quite sweet, so some people enjoy it with dessert.